How much is too much? It’s been quite a long time since I spotted this skipper butterfly in a dry arroyo in the White Tank Mountains Regional Park, west of Phoenix, Arizona. There weren’t many butterflies there at any given time, but I came to realize that almost any butterfly you saw in that other-worldly habitat . . . might be new and exhilarating! Almost all I saw there, on many trips to that surreal arid region, refused to tolerate close approach. This view shall have to suffice, though it’s pretty good, and the Fuji Velvia 50 slide film I used is always color true. So much time has gone by, and now I am determined to take a stab at it. Eufala Skipper (Lerodea eufala)? Ken? Jeffrey? The NABA cognoscenti? Curt? They were rare sightings back in Pittsburgh. I don’t ever remember seeing Skipper butterflies in the New York City metropolitan area or in the Berkshire Mountains of western Massachusetts. Here in Georgia, they are that big word, ubiquitous, seen alot, in most places. They fly low, fly away on your approach, in sum, a very at arms length butterfly. This one here, she was seen in the Butterflies & Blooms Briar Patch Habitat in Eatonton, Georgia. 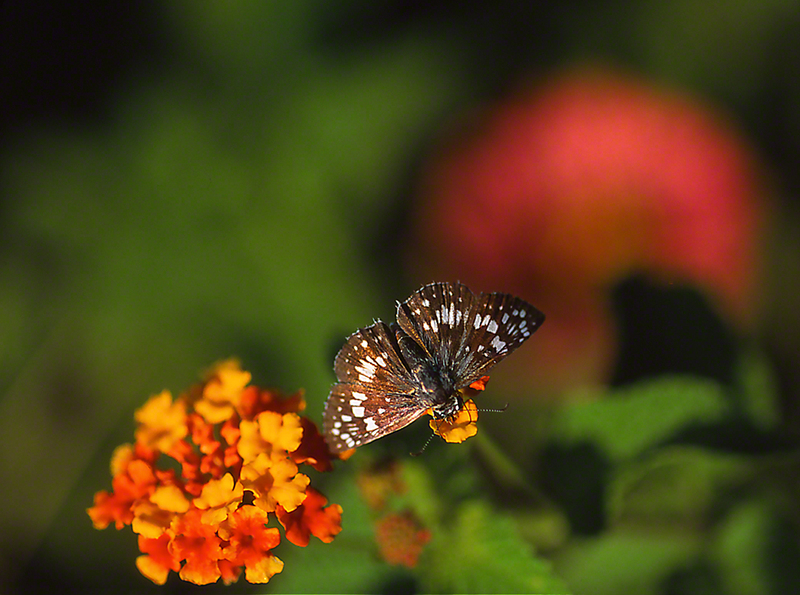 I see many more males than females, so this gal, preoccupied with lantana blossoms, was a nice capture, on a hot sunny Georgia morning. 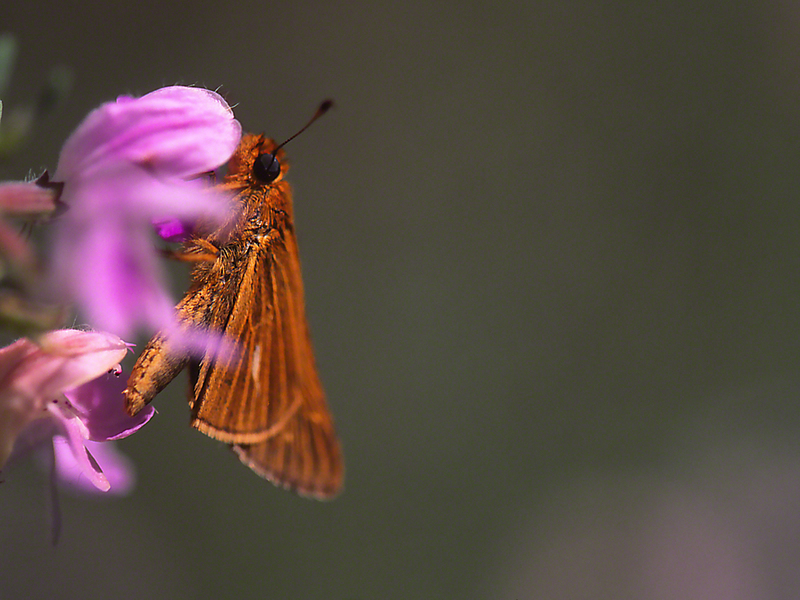 Where Do You Find A Salt Marsh Skipper? Exactly! And that’s where I met this handsome example. This Salt Marsh Skipper was nectaring in the ‘butterfly’ garden at the Harris Neck National Wildlife Refuge near Townsend, Georgia. We were at the coast, just moments from the nearest Saltgrass, their hostplant. They fly in the salt marshes of the United States, from Massachusetts, along the coastline all the way to Texas. They among the grass skippers. They’re easy to identify, with that long horizontal pale strip on their hindwings. They are very kind, much tolerating the intrusion of the Macro- camera lens, to just inches from them. It seems that nectar near totally dominates their being, and my approach, no problem! They ground me in reality. We sometimes get too big for ourselves, asking why this or that creature ‘deserves’ to continue its existence. Would not a nice development of fine homes be more important than that population of skipper butterflies that lived there for say, 200 years? Uh, NO. I’d say that there are some 200 or more good reasons to splat! that suggestion, as we do to Musca domestics on a July day.